Happy 113th Birthday Dr. Seuss! Whether it’s the childhood memories of his books or you’re watching the new films today, Dr. Seuss’s tales are “too good to miss.” Theodor Seuss Geisel was born on March 2, 1904 in Springfield, MA. 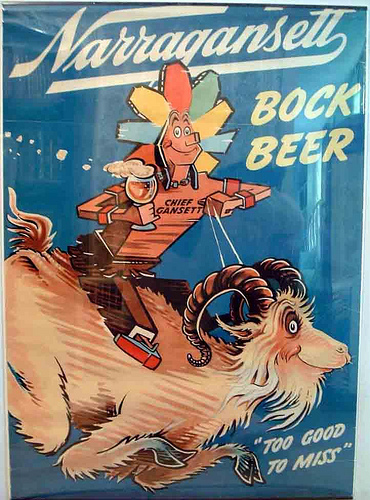 Remember those famous illustrations he made for Narragansett Beer back in the day? The most famous being the tray shown above. Antique collectors date these works around the 1940′s. He did other illustrations that appeared in print ads and coasters like this one. One of the most interesting facts was that both his father, Theodor Robert Geisel, and grandfather Geisel were brewers. In fact, his German immigrant grandfather owned the Kalmbach and Geisel Brewery, or “Come Back and Guzzle” as the locals called it, in Springfield. In 1894 it was renamed the Highland Brewery and five years later it became part of the Springfield Breweries. But in 1919 on the day Theodor Robert became president, prohibition forced the brewery to close forever. His father got a job as the city’s Parks Superintendent, but Theodor Seuss must have never forgotten how prohibition forced his family business to close. While attending Dartmouth College during prohibition he was arrested for throwing a drinking party and kicked off the Jack-O-Lantern, Dartmouth’s humor magazine. He continued to secretly submit works signed “Seuss.” This is the first record of Theodor Geisel using the “Suess” pseudonym which is both his middle and mother’s maiden name. He even created anti-prohibition political cartoons. 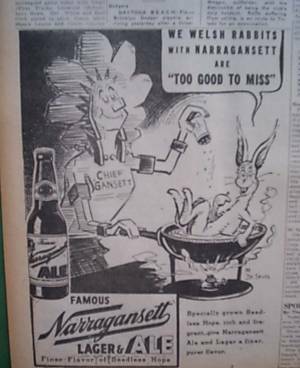 In the late 1930′s he was eventually hired by Rudolf Haffenreffer Jr., President of Narragansett, to develop the Chief ‘Gansett ads. 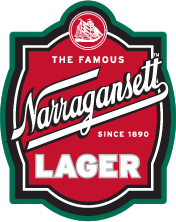 Although Seuss never got his chance to brew in the family business, it’s clear he stayed true to the roots of his German heritage and tied it in with New England for Narragansett Brewing. 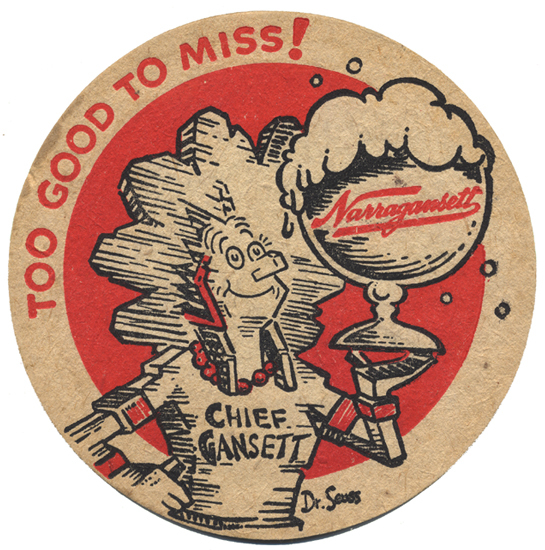 The Chief ‘Gansett illustrations were iconic during Rudolf Haffenreffer Jr.’s reign as president of Narragansett and the Seuss tray and coasters have become hot breweriana items for collectors everywhere. 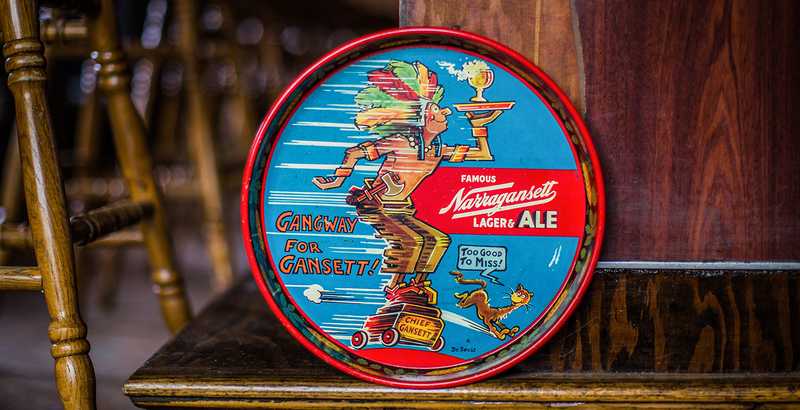 Happy 110th Birthday, Dr. Seuss – Have a ‘Gansett!